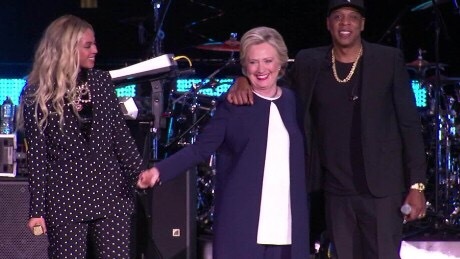 CLEVELAND — In an election year when Hillary Clinton is depending on young black voters to turn out, she may have gotten her biggest boost yet here on Friday.Some of the most famous names in hip-hop came out to rally votes for her at an event that featured Beyoncé, Jay Z and Chance the Rapper, all of whom implored thousands of cheering people to back the Democratic presidential nominee. 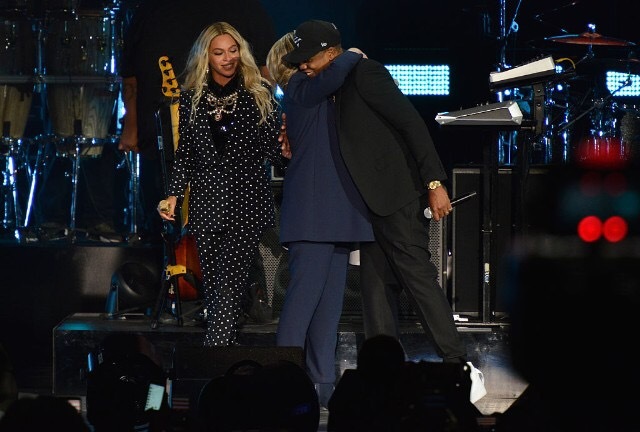 “Hello, Cleveland!” Mrs. Clinton said as she stood onstage with Beyoncé and Jay Z. “When I see them here, this passion and energy and intensity, I don’t even know where to begin because this is what America is, my friends,” she said. At the concert, aimed largely at urging black voters and millennials to vote on Tuesday, some of the biggest stars emphasized the historical significance of potentially electing the first woman as president. The reasons were apparent. While black voters catapulted Mrs. Clinton to victory in the primary contest against Senator Bernie Sanders of Vermont, black turnout is down from 2012 in several states and young black voters have proved somewhat resistant to supporting Mrs. Clinton in the general election. Yet the challenges facing Mrs. Clinton were clearly on display on Friday. When she took the stage and began making the case for her candidacy, dozens of people began leaving the arena, the performance now over. Beyoncé took the stage just before 10 p.m., and after singing “Formation,” she put Mrs. Clinton’s candidacy into the context of women’s suffrage and the feminist movement. “I want my daughter to grow up seeing a woman leading the country,” Beyoncé said to roars from the crowd. “That’s why I’m with her,” she added, using Mrs. Clinton’s campaign slogan. 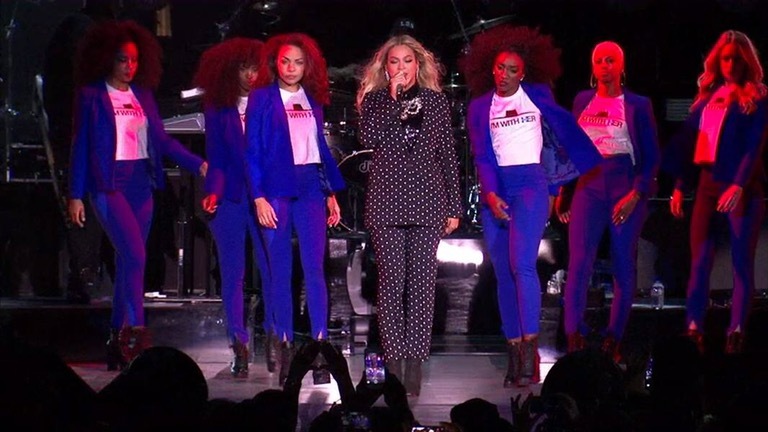 The artist’s backup dancers even wore blue pantsuits, à la Mrs. Clinton. The concert had a similar, though subdued, feel to one of Barack Obama’s closing events in Cleveland in 2008, when a largely black crowd of 80,000 waited for Bruce Springsteen to finish to get to the real star: Mr. Obama. Chris Stevens, 29, of Cleveland, said he was a “big Hillary Clinton fan” and expressed confidence she would win on Tuesday. Signs of what might be a close race were reflected in his family, however. Mr. Stevens, his wife and his parents plan to vote for Mrs. Clinton, but he said his 37-year-old brother, who is a police officer and runs a small business as a D.J., plans to vote for Mr. Trump because he believes he would be good for business owners. Other performers, including Steve Aoki, Jon Bon Jovi, Katy Perry, Stevie Wonder and Ne-Yo, are also hosting get-out-the-vote concerts for Mrs. Clinton. The events come as Mrs. Clinton is trying to motivate people in Ohio to vote early. Younger voters are shunning the two major political parties on a scale not seen since Ross Perot’s third-party bid for the presidency in 1992, a striking swing in public opinion that is cutting into Mrs. Clinton’s thin margin for error. 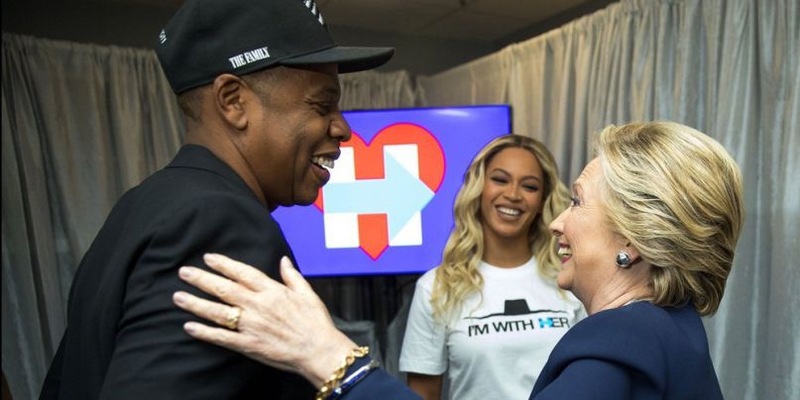 The rally with Jay Z and Beyoncé comes at the end of a campaign in which Mrs. Clinton has carefully cultivated black support. She devoted the first speech of her campaign, nearly 18 months ago, to calling for an overhaul of the criminal justice system and ending “the era of mass incarceration” that has disproportionately affected black men. She has spent many Sundays worshiping at black churches across the country. She spoke at a church in Flint, Mich., to plead for help with the city’s water crisis, and she campaigned with the mothers of Sandra Bland, Eric Garner, Trayvon Martin and others who have lost children to gun violence or after encounters with the police. In North Carolina, where a federal appeals court accused Republicans of an “almost surgical” assault on black turnout and Republican-run election boards curtailed early voting sites, African-American turnout is down 16 percent. And in Ohio, which also cut back its early voting, voter participation in the heavily Democratic areas near Cleveland, Columbus and Toledo has been down. On board the Clinton campaign plane on Friday, John D. Podesta, Mrs. Clinton’s campaign chairman, suggested unfavorable comparisons between Mrs. Clinton’s performance among black voters with Mr. Obama’s were unfair. “Look, President Obama was the first African-American president, so he had a level of enthusiasm, commitment that we’re trying to push toward beating, but obviously he has advantages there,” Mr. Podesta said.